While my interest in radio controlled cars is somewhat limited to a period from the late 70’s (Tamiya Rough Rider) to the early 90’s (Kyosho Pro-X), I always had a “fetish” for old radio systems. I’ll guess that comes from my late neighbor, who had a lot of really old systems, and actually was the one who got me interested in RC in the first place. My main interest in old systems has been old car specific radios, like the Futaba “Brown Box” FP-2E, the old Sanwa Machine professional radios, old KO Propo hand sets, and the various Kyosho Astro and Astro Racing systems, thinking those must have been the oldest steering wheel radio systems that were specifically made for cars. My Futaba FP-2E and Robbe Super Race steering wheel radios. This “Brown Box” Futaba had its electronics modified by CRP owner Mike Tobey, back in the day. 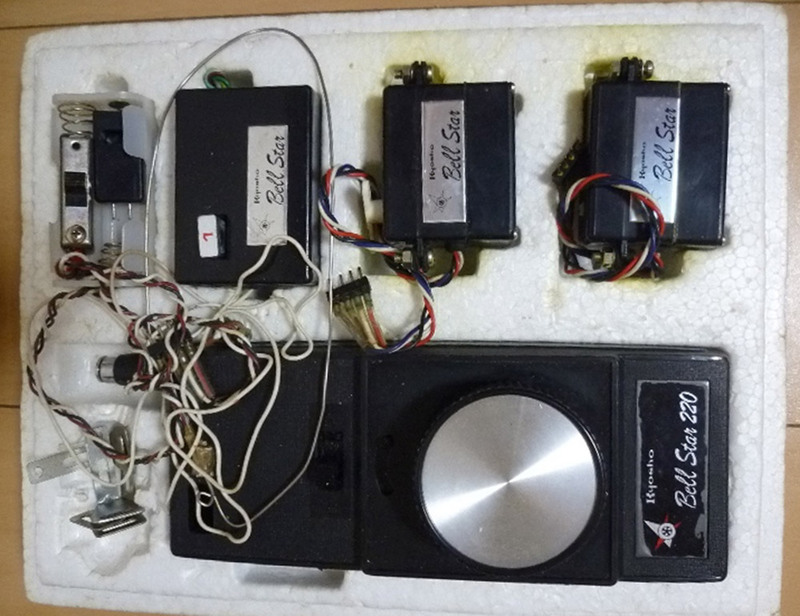 Then some years ago I read somewhere that Kyosho actually had a system that was much earlier than the 1975 Futaba “Brown Box” and the 1980 Kyosho Astro Racing steering wheel radios, and that this system was from around 1970. No pictures, just some talk about it. As a kid I had never seen this in the catalogs, and the Astro Racing radios were the oldest Kyosho steering wheel radios I could remember having seen. 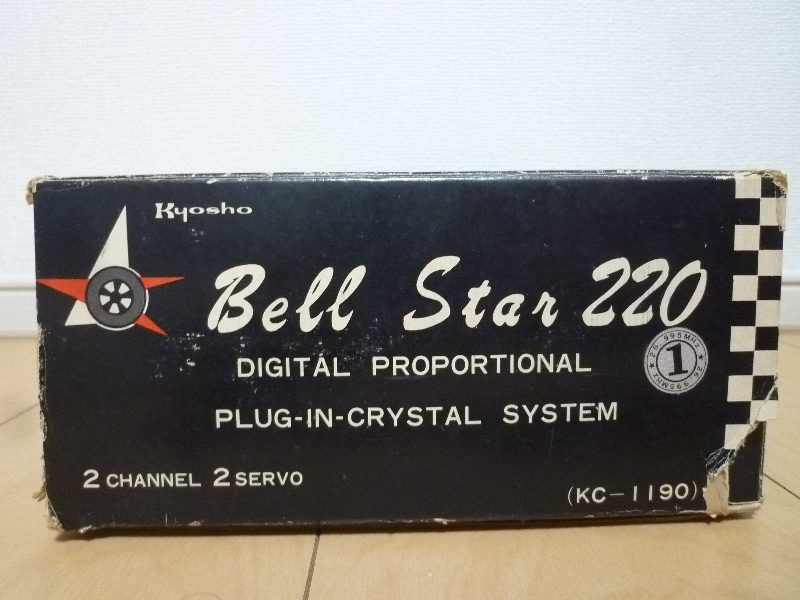 A search on google didn’t come up with much, but it returned a link to Kyoshos historical pages, where I found a microscopic black & white thumbnail photo of it, stating it was released in 1971, and was called the “Bell Star 220”. The system had supposedly been made by Kyosho as they were starting to develop RC cars, and Kyosho boss Hisashi Suzuki found it weird to control a car with sticks, like it was a plane. I never really found anything more about this system, and never saw anything remotely like it neither on forums, facebook pages, eBay nor the Japanese auction sites. As it was shown on Kyoshos historical timeline I knew it was for real, but I thought maybe it had been produced in such small numbers that none had survived. 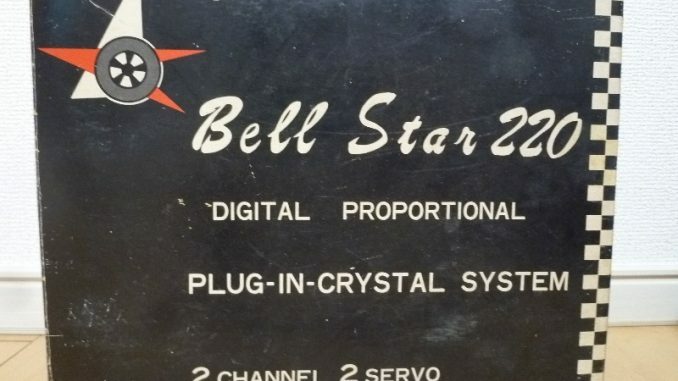 After all it was a very specialized system, made for a very limited market, nearly 50 years ago. So I forgot about it, probably knowing that this was really nothing I would ever have a chance to own, or even see a decent picture of. The 1980 Kyosho Astro Racing radio systems with separate radio and controller units came in stick and steering wheel versions. During the years I have collected a few variants of the before mentioned FP-2E, both in original Futaba brown, and a very cool black one disguised as a Robbe. I have a boxed set of the 1978 Kyosho Astro stick radio and a spare set of the iconic red receiver and servos that came with it. I have four sets of the 1980 Kyosho Astro Racing radios, two of the stick version and two of the steering wheel version, one of each is boxed. I also have quite a few extra receivers and frequency modules for those systems, both on 27 and 40 MHz. I also have a couple of the newer Kyosho Pulsar steering wheel radios and the Kyosho Impulse stick radios. A couple of my old KO handsets, and my 4 channel Acoms AP-440FM radio with shifter plate made for the original Tamiya 3 speed trucks. Then suddenly, by pure chance, something caught my eye as I was browsing through some Japanese auctions. I didn’t immediately connect it to the “lost” Kyosho system, but I opened the auction page and voila, there it was in bright and shiny hi-definition technicolor, the “Kyosho Bell Star 220 Digital Proportional Plug-In-Crystal System”, with the auction ending in 2 days, 14 hours, 34 minutes and 55 seconds. Starting price 10.000 Yen, one bid already in, and 5 minute rule for late bids activated. 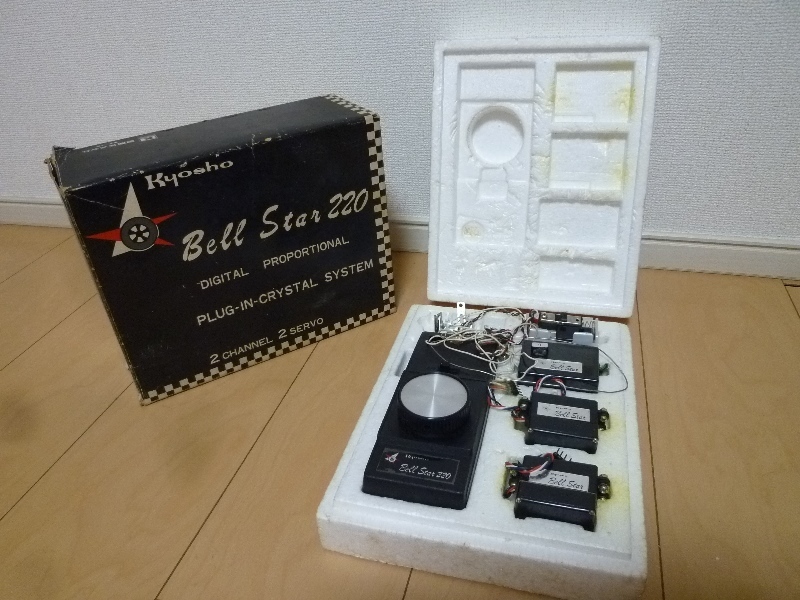 The 1971 Kyosho Bell Star 220 that I found on Japanese Yahoo! auctions. The system was used, but the box had made it through its 50 years life, and actually looks pretty decent for its age. One can only speculate what this could be worth, seeing what other rare vintage RC items are being sold or listed for. I know, value is nothing, selling price is everything, but it’s a fun exercise nevertheless. I also know that rare radio systems seem to go for a lot less than rare cars, like the Tamiya Blazing Blazer and the Hirobo Jealousy. But given it’s age and the extreme rarity of this kit, I will not hesitate to value it up there amongst those cars. And by “value” I mean “value for ME”. I would much rather like to have this than a Blazer or a Jealousy, but then I’m a sucker for everything vintage Kyosho. We all value things differently, at least those of us who are not into this for the monetary value alone. I have seen a lot more Blazers up for sale, and even the odd Jealousy once in a while, but I have never before seen this, and I have been on Facebook and eBay since their very beginnings, and on Japanese Yahoo! for quite some years now. It seems to be so rare that it actually could affect the monetary value in a negative direction, as nobody seems to even know what it is! As usual many of the nicest Japanese auctions ends while I’m still at work, and being a teacher working in a classroom, I can’t really follow them to the end. On the day of the auction ending, I put in a medium high bid. Not as high as I had decided to go, but class should be finished by the end of the auction, so I thought I would be able to follow it to the end this time, doing the infamous “5 minute dance”. During the day I had a few chances to check how the auction was going, and I had seen the number of bids were rising, and the price was starting to reach my preliminary max bid. But of course something came up, and I couldn’t finish work at time, so I concluded that everything was lost, and comforted myself with at least I now had some decent pictures of it. When I eventually had the chance to check my phone, I was shocked that the bids had stopped right below my max bid, and the text “YOU WON THIS AUCTION” graced my eyes. Only a few Yen more, and that would have read “YOU LOST THIS AUCTION, YOU CHEAP LOSER!”. So now I’m the proud owner of something nobody knows what is, something I have no period correct car to put it in, but something that is damned cool, and the first steering wheel radio control system in the world (Kyoshos claim, not mine). I feel good! 26.995 MHz, a legal frequency here in Norway! That’s awesome, have you tried it to see if it still works? It’s still in Japan. Stuff I buy there are sent to me every other month or so. I’m looking forward to testing it, to see if it still works.